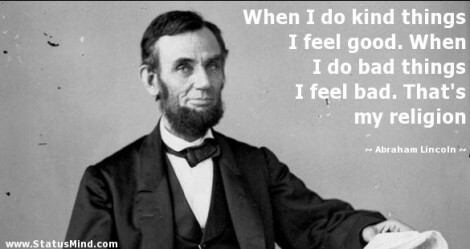 One quality is immediately obvious that both Lincoln and the Holy Prophet Muhammad were both liberators of slaves and there are many other commonalities between them, but, today I want to stress their emphasis on human conscience for noble and compassionate living. Seek the guidance of thy soul! Seek the guidance of thy soul! Seek the guidance of thy soul! The virtuous deed is one whereby thy soul feels restful and thy heart contented, and sinful act is one which rankles in thy soul and which contracts thy heart even though the other people endorse it as lawful.